We love it when people come from London to visit The Tranquil Otter. You’ll return to your city life refreshed and feeling ‘at one’ with nature. North Cumbria has always been a bit of a Cinderella to the Lake District National Park, even though Carlisle is undeniably historical with its Castle, Cathedral and that Wall that Hadrian built. That said, we’re proud of the region and love seeing the amazed faces of our guests when they discover the wildlife, the peace and the delicious sweetness of the fresh air. With an average travel time of 3 hours 30 minutes from London Euston and 17 trains a day, we think you’ll agree that North Cumbria a great destination for a long weekend or a midweek break. Here we feature 7 top tips to make your stay in Cumbria unforgettable…so go ahead and don’t miss out on fantastic experiences! 1. Walk along the marsh on the Solway – great any time of year for the hardy, and from Spring to Autumn for the rest of us. 2. Hadrian’s path walk from Beaumont to Carlisle along the river – enjoy the open space – watch out for Herons and Otters by the river bank as you approach Carlisle. Map booklet detailing walk along Hadrian’s Wall path available online from Cicerone. Cathedral – so much to see in the grounds, and check out that ceiling! Tullie House – Jacobean family home, later a library and now an art gallery and museum. Old Town Hall – why does that clock tower only have three faces and no time facing north? Guildhall Museum – believed to have been built in 14th Century by City trades to protect themselves. City Wall – still standing the test of time. Did you now that the American President Woodrow Wilson’s mother was born in Carlisle? 4. Enjoy a day of clay pigeon shooting at Greenquarries, a nearby shooting ground where you can learn how to shoot, or improve your existing skills. 5. Spend a day learning about Eagles, Osprey, Hawks, Falcons and more. The Cumberland Bird of Prey Centre will teach you how to handle and train these magnificent birds. 5. The region has scores of cosy country pubs with delicious locally produced foods. 6. 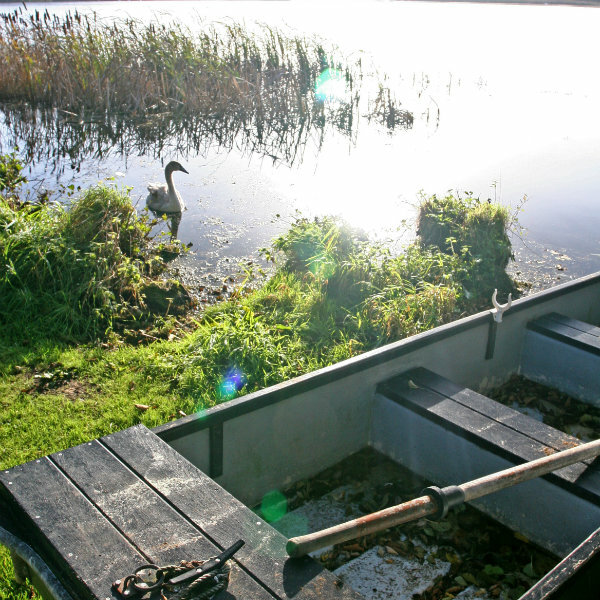 Enjoy a picnic on a boat on a private lake, surrounded by wildfowl. 7. Relax in your own hot tub, and enjoy a Spa treatment in your lodge. 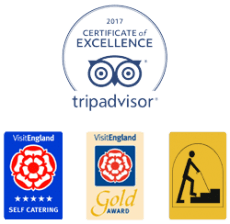 Why not treat yourself to a relaxing break at the Tranquil Otter. Now booking for autumn 2016. Check live availability here.